For the first time ever in Bangladesh an effort to locally manage local internet traffic was made through the introduction of Bangladesh Internet Exchange (BDIX), a not-for-profit partnership between Sustainable Development Networking Programme (SDNP) Bangladesh. BDIX establishes a physical interconnection between ISPs to exchange internet traffic. Bangladesh still depends on satellite bandwidth sharing, which causes any transfer of files or mails between local ISPs to go through the channels of foreign servers, taking up more bandwidth and resulting in a huge expenditure of foreign currency. The local server at BDIX will facilitate faster net access for any local traffic by providing faster connection between BDIX member ISPs. 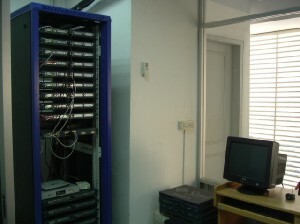 The bandwidth project was taken up in August 2004 by the Sustainable Environment Management Programme (SEMP) of the Ministry of Environment and Forest (MoEF), which is funded by UNDP and executed by Bangladesh Institute of Development Studies (Bids) and Internet Service Providers of Bangladesh. The current status and advantages of BDIX were discussed at a press briefing on November 6 at the BDIX Pilot office of SDNP Bangladesh in Pantha Path. A detailed technical presentation on BDIX was made by Dr Hakikur Rahman, project coordinator of SDNPBD at the event. Using Cisco routers to channel the local traffic, BDIX expects to manage all local internet traffic locally and thus enhance user compatibility and lower bandwidth cost. "We are hoping to cut down the foreign currency loss due to international routing of local traffic," said Dr M Asaduzzaman, research director and project director of BIDS and SDNPBD Bangladesh, lamenting that local web users in Bangladesh go all around the globe to send email to their next-door neighbors. "We look forward to country-based international web-mails such as mail.yahoo.co.bd," states Dr Rahman. He commends the government's enthusiasm to support such efforts to collaborate with internet giants. "At present, six local ISPs are connected through our BDIX network," states Dr Rahman, naming ISN, Bangladesh Online Ltd. (BOL), BDCom Online Ltd., SDNPBD, Link3 and AccessTel. Four other ISPs are in the queue to be connected through BDIX. Most of these ISPs are using DSL or Radio-link connections to amend the quality of usage. "We hope that the regulatory board will continue providing a supporting environment for such exchange server," said Dr Rahman. The exchange server membership at present is free of cost. "We are still in the testing-phase," he explained. Thus BDIX does not plan on acquiring any finance from its members as its project is well-established and runs on full-comprehension. The expected time frame on such matters may well range from two to five months or a little more, while BDIX acquire further troubleshooting skills on the exchange server. "All we are looking for is a larger number of members on the server, a good promotion, and then we can go ahead and claim our share of pioneering the effort," Rahman added. The creators of the exchange server plan to establish a national data centre within a short period. The net exchange server will then include web server, local newspaper server, chat server and net filter server. This data centre will also include a server for academic and research institutes of the country, corporate networks, financial sectors, and possibly all the local ISPs of Bangladesh. SDNPBD has already set up radio links in Dhaka and Mymensingh to set up routing nods for the exchange. Other regional links yet to be set using VSAT nodes include Satkhira, Cox's Bazaar and Barisal districts. The server administrators are willing to take their efforts to the grass-root levels to offer the goods of net connection to the locals of such rural areas. The submarine cable is expected to enter the country through Cox's Bazaar, which is one reason why BDIX has chosen Cox's Bazaar to be one of the major routing nodes of the exchange server. The administrators expect to establish multipurpose village information centres, which will be the ultimate target for BDIX. "We already have a successful model running in Phulpur," states Dr Rahman. BDIX will be using the routing nodes at Khulna, Barisal, and Cox's Bazaar to reach out the rural localities from these locations. At the same time, northern regions of Bangladesh will now be under specific emphasis. "Mid and southern Bangladesh have been attaining some development on IT sector expansion, unlike the northern regions," Dr Rahman added. SDNPBD will now focus on development of these locations using specific terms and supporting regulations hoped to be offered by BTRC. SDNPBD has received remarkable donations from Packet Clearing House (PCH), a US-based non-governmental organisation (NGO), which has supplied SDNPBD with remarkable numbers of computers along with two Cisco routers and a Sun Solaris server. In turn, SDNPBD has distributed computers to sixty-four schools throughout the country including rural locations of Chuadanga, Natore, MunshiGanj and Jhinaidaha. Other achievements of SDNPBD so far include establishment of news and media support programme in major press clubs throughout the country in partnership with the National Press Club. Objectives of such an effort include a quicker and efficient news flow throughout the country as well as removing digital division among journalists. This is expected to build a stronger local and international media network. There is no doubt that this enormous project will be a boon for the rural ICT development for Bangladesh once implemented. The exchange server has already started taking local bandwidth loads within three months of its existence. More frontline ISPs should join hands to make this project a success and help build a technologically independent Bangladesh.